Lock in a great price for Hostel Enot – rated 8.9 by recent guests! The staffs were very nice! They helped me exchange the big bank notes into smaller one since I had trouble using it in the city. The location is also great! just in front of the train and tram station! Friendly staff and air conditioned room during a heat wave. Excellent location right across from the train station. I think the way the room are organized are awesome, just 2 rooms per bathrooms, the room is very big and comfortable. The restaurant is good and cheap. 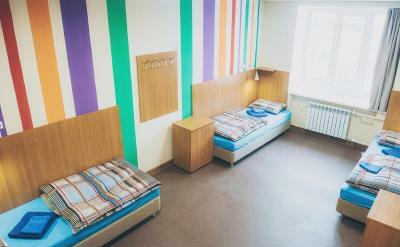 The hostel is in front of the main trail station and it is near to the kreamlin. It was very clean and comfortable. Staff was very friendly and professional. Very clean and confortable. Nice staff. The restaurant/bar at the hostel is excellent and provide a very good and cheap food/breakfast. Perfect location right in front of train station. 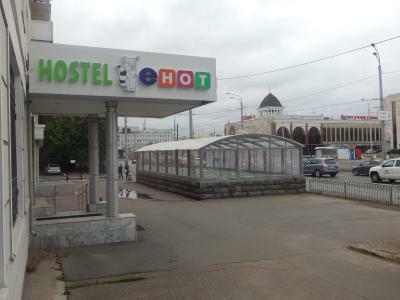 well located just in front of kazan train station, and 10 minutes walk to the historical sites. Great location close to the train station and easy walk into town. The hostel is huge! 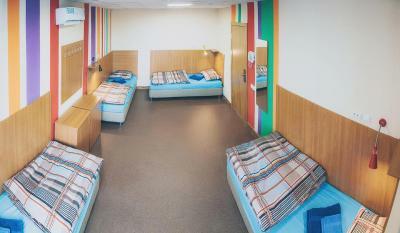 Great use of space makes it feel more luxurious, the rooms were huge, nice to have single beds rather than bunks. Great use of double doors keep it sound proof and mean bathroom only used by 3 rooms. Nice lounge area upstairs. 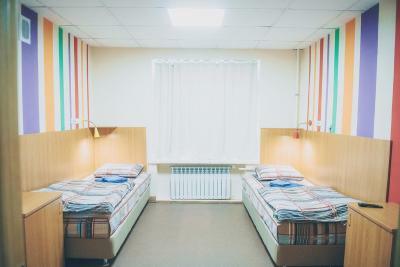 Enot Hostel is set in Kazan City Center, within a minute walk of the Central Train Station. Kremlevskaya Metro Station is 1,650 feet away. The property features private parking. The rooms come with shared bathrooms. 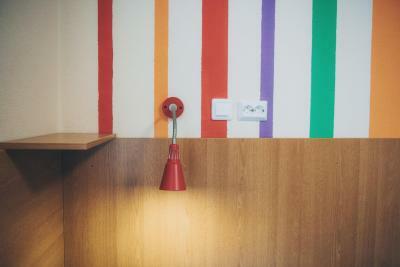 Hostel Enot features free WiFi throughout the property. Certain rooms feature a flat-screen TV, a fridge and air-conditioning. You will find a 24-hour front desk and a shared lounge with kitchen at the property. Qol Sharif Mosque is 2,950 feet from Hostel Enot, while Kazan Kremlin is 0.6 mi away. Kazan International Airport is 15 mi from the property. 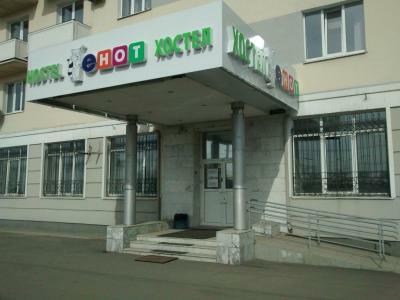 뀐 Located in the real heart of Kazan, this property has an excellent location score of 9.4! When would you like to stay at Hostel Enot? 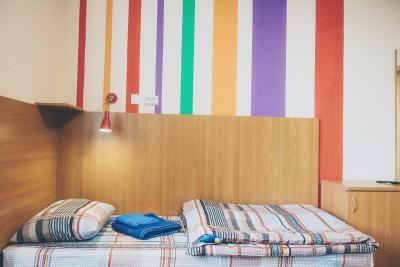 House Rules Hostel Enot takes special requests – add in the next step! Hostel Enot accepts these cards and reserves the right to temporarily hold an amount prior to arrival. Please note that guests booking more than 6 beds are required to pay a full prepayment. The property will contact you for further details. Near train station, easy to find, just over the cross. A lot bus can going to city center. 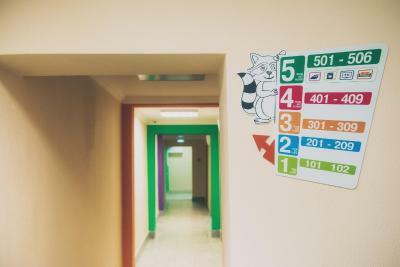 Laundry in 5 floor but russian only, can find someone to help from the rest room . The hostel is very near to the train station. The staff are helpful. The breakfast is amazing. And the room is unexpectedly large and comfortable. It might be helpful if there's some English explanation of how to use the washing machine. Toilets were not kept very clean! Very central location opposite the train station. Spacious room. Friendly staff. There is no air conditioning neither in the rooms nor in the public areas. 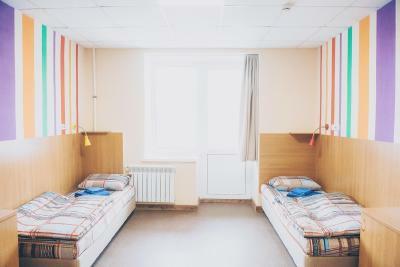 The summer in Kazan could be extremely hot and it is unacceptable not to have The bathrooms should be clean better and more often, they were normally dirty. The location was perfect, it was clean, tidy and the staff was friendly. Lovely city as well. The staff is very friendly, they offer breakfast at a very good price. There's a supermarket really close as well as a shopping center. It's a short walking distance from the kremlin. Great value for money. Close to train station and central part of town. Air conditioned rooms.